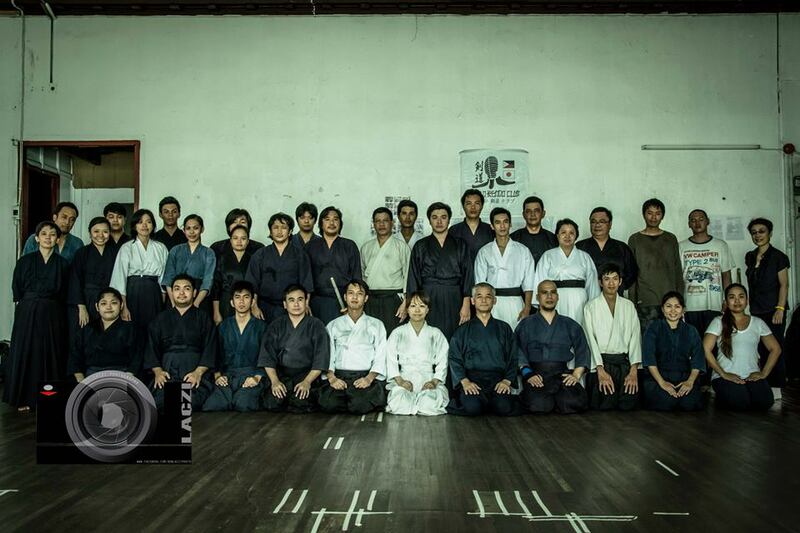 Last July 1 & 2, the IGA-Kendo Club had its first official visit to the Iloilo Kendo Club. This was achieved after months of planning, involving IGA-Ken’s Head Sensei, Mr. Koji Igarashi, IGA-Ken’s Arena Dojo Manager, Mr. Kristopher Inting, and the Iloilo Kendo Club Dojo Head, Mr. Ryan Gomez. After numerous communications, some nervous waiting, and some last minute hitches, the 17-person IGA-Ken delegation finally touched down in the Iloilo International Airport last July 1. They were greeted by Mr. Gomez and some of his dojomates. They were then brought to one of Iloilo’s Seaside Restaurant for a sumptuous lunch, before checking into the GoHotel for a short rest. IGA-Ken with Iloilo-Ken. Please click on the picture to view the album. We are happy to report that after the session we could see a marked improvement in the kihon of the Iloilo-Ken members. Igarashi-Sensei was happy with this, and the members of Iloilo-Ken were grateful for the instruction given to them by Sensei and the IGA-Ken members. In fact, the improvement was enough that Igarashi-Sensei proposed that a shiai would be held on the second day, instead of the further kihon practice that he had originally planned. The Iloilo-Ken members took this news with some excitement and some nervousness, as this would be their first experience in shiai ever. But that would be for the next day. July 2 dawned bright and sunny, in stark contrast to the previous day’s weather. It was a good thing too, because this was the day for the Guimaras Tour and Island Hopping! The members of IGA-Ken would like to thank our hosts, Iloilo-Ken and especially to Mr. Toni Tamayo, for arranging this tour. As before, the pictures will tell a better story than simple words, so enjoy browsing the album! Fun in Guimaras! Please click on the picture to view the album. We had so much fun that at the end of the day, we almost did not want to go back to the dojo for the final day of training…almost. Somehow, in spite of our tired bodies, we made it back, and the first Iloilo Kendo Club Shiai commenced! If you want to see videos of the matches, please browse the Iloilo Kendo Club Facebook Group and look for them there. The members of both IGA-Ken and Iloilo-Ken were divided into two teams, one captained by the Iloilo-Ken’s Ryan Gomez, and the other captained by IGA-Ken’s Kayo-San. In the end, the day was won by Ryan’s Team. Aside from his team winning, selected members of Iloilo-Ken got fighting spirit awards. There were two stands outs though, and they were Andre and Zeni, who both displayed the strongest fighting spirit of the night. The seminar ended with final words from Mr. Gomez, Mr. Inting and Igarashi-Sensei. And Igarashi-Sensei had one last surprise for Ryan, as he donated some of his personal shinai to help inspire Iloilo-Ken to keep on doing their best. Ryan graciously accepted the gifts, and thus ended the event. We ended the seminar on a high note. Iloilo-Ken learned many tips from our club. At the same time, we gained valuable experience on how to conduct a seminar or training course far away from our home dojo in Metro Manila. And finally (and probably most importantly) both clubs gained new Kendo friends and came away with a greater appreciation for one another. Congratulations to both clubs for staging this wonderful event! If anyone from Iloilo is reading this, and would like to join the Iloilo Kendo Club, please look for them every Wednesday, 6:00pm – 8:30pm at THE MASONIC TEMPLE Dojo, 3rd Floor, J.M. Basa St., (in front of Plaza Libertad beside Medicus PPTS). Or contact them via their Facebook group (link in the article above). This entry was posted in About, Competition, Events, Instructors, Kendo, Milestones, Socials, Stories / Testimonials, Training Schedule and tagged Guimaras, Iga ken, Iga Kendo, IGA Kendo Club, Igarashi, Igarashi Sensei, Iloilo, Iloilo Kendo Club, jigeiko, keiko, kendo, Koji Igarashi, Martial arts, Philippine Kendo, Philippines, Ryan Gomez, shiai, tournament, training schedule, vacation, workshop. Bookmark the permalink. Mabuhay at pagbati sa Iloilo Kendoka at sa IGA sa patuloy na suporta sa ating pinoy kendoka!